Managing Snow & Ice will educate readers on every aspect of owning and operating a snow and ice removal company, from pricing to plowing methods. Novices will gain a solid understanding of all levels of the industry, while experienced pros will find insights to boost productivity and profitability. 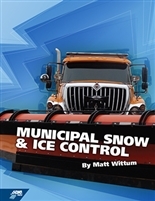 With an annual price tag of 2.3 billion dollars for snow and ice control operations in the U.S., public works budgets can be stretched to the limit in the 70% of the nation considered to be “snowy regions.” This book is for everyone who is involved in snow and ice control in a public agency. It covers materials, application, equipment, weather, and takes the reader from “before the season” to “after the storm” in scope. Sample municipal manuals and policies are also included.